Dolomite, a world leader in microfluidics innovation, will be previewing its innovative Fluidic Factory at MicroTAS 2015 in Gyeongju, Korea, on the 25th of October. The first commercially available 3D printer for fluidically-sealed devices, it offers rapid, straightforward and reliable printing from as little as $1 per chip. Using FDA-approved, robust cyclic olefin copolymer (COC), this makes it easy and affordable to 3D print devices for almost any application. 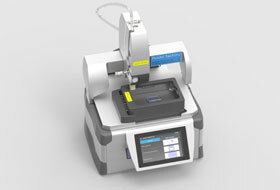 The Fluidic Factory is an intelligent 3D desktop printer that enables the production of truly unique microfluidic devices, such as three-dimensional mixers and non-rectangular chips. By offering reliable sealing of fluidic paths, it allows users to reliably create bespoke channel geometries and various features not possible using etching, embossing, moulding or machining techniques. The print head, print bed and software are designed to be upgradeable, ensuring future functionality for printing different polymers, ultra-high definition printing, micro-milling, fluid dispensing or bioprinting. Users can choose from the wide selection of designs in the Fluidics Factory’s Drawings Library – including microfluidic chips, manifolds and connectors – or create and print their own custom devices using virtually any CAD software files, giving complete design flexibility. For more information, visit the Fluidic Factory webpage.